I believe BRAVO-6 is the best and most stable company to produce Vietnam War figures. What makes me think that is not only the sculpting and casting quality of their figures. They release new figures every month uninterrupted and each month you can find a few figures from the different sides or periods of war. One of the latest releases belongs to the early days of Vietnam conflict – Indochina War. B6-35201 Huguette Agony(3) includes a French Paratrooper from Battle of Dien Bien Phu ’54. The Battle of Dien Bien Phu was the biggest and most ferocious battle that took place between the French Far East Expeditionary Corps and the Viet Minh forces supported by China and Soviet Union. French began an operation to support their soldiers at Dien Bien Phu. Its purpose was to cut off Viet Minh supply lines into the neighboring Kingdom of Laos and tactically draw the Viet Minh into a major confrontation that would cripple them. Instead, the Viet Minh surrounded and besieged the French, who were unaware of the Viet Minh's possession of heavy artillery and more importantly, their ability to move such weapons through extremely difficult terrain to the mountain crests overlooking the French encampment. The Viet Minh occupied the highlands around Dien Bien Phu and were able to accurately bombard French positions at will. The French repeatedly repulsed Viet Minh assaults on their positions. Supplies and reinforcements were delivered by air, though as the French positions were overrun and the anti-aircraft fire took its toll, fewer and fewer of those supplies reached them. After a two-month siege, the garrison was overrun and most French forces surrendered, only a few successfully escaping to Laos. Communist forces defeated French troops suffering 14,000 casualities. Shortly after the battle, the war ended with the 1954 Geneva Accords, under which France agreed to withdraw from its former Indochinese colonies. The accords partitioned Vietnam in two; fighting later broke out between opposing Vietnamese factions in 1959, resulting in theVietnam (Second Indochina) War. The figure comes in standard BRAVO-6 cardboard box with the figure parts inserted into seperate small plastic zip-lock bags. The box shows a photo of the assembled and painted figure which can serve as a basic painting reference. The figure is sculpted by Vladimir Demchenko as a French Paratrooper of CEFEO - French Far east Expeditionary Corps in a standing pose with holding a rifle in one hand as throwing a grenade wtih the other. It is cast in medium grey resin with crisp details. As usual, the parts come with casting blocks that can be easily removed with no damage and little effort. There will be almost no need for a cleanwork. Body part : It comes with head and legs. Arms are given as seperate parts. Facial details are well defined with an open mouth. No hair is sculpted and head is carved on the top for the good fit of helmet. Liner covering ears of French modified M1 paratrooper helmet is cast on the head. He wears M1947/52 Model Tenue de Saut Camouflé - French Paratrooper Jump Uniform in Lizard camouflage. The jacket has two big breast pockets and two small diagonal waist pockets. The trousers has two big cargo pockets on both sides and 2 small ones inside the big pockets. Cloth folds, pocket details, shoulder straps and flap type groin guard on the back of the uniform used during jumps are well represented. Over his uniform, he carries half-filled sandbags slung in front and back secured with robes as improvised splinter armor. Please see the reference photo on the right taken from the Osprey book. Two doubled pouched ammo pouches are cast on both sides attached to the belt. 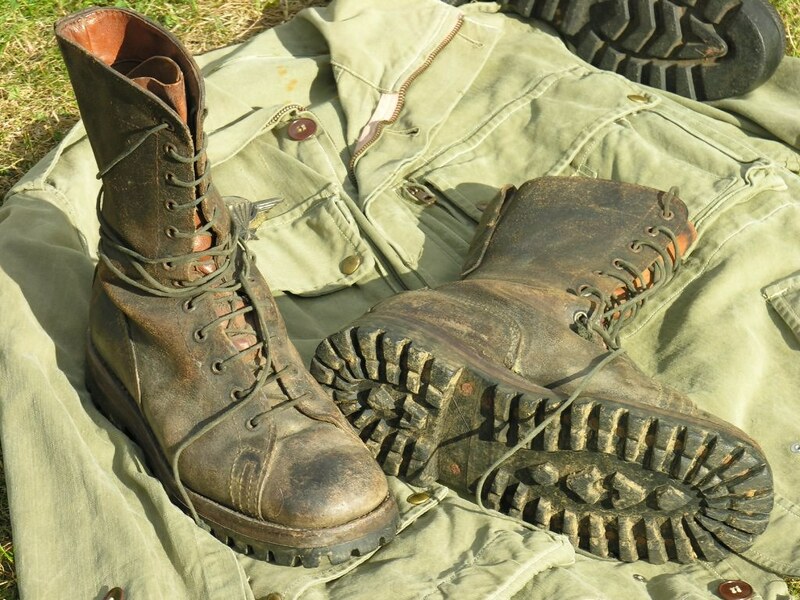 As for the footgear; he has M1950 Jump boots. Helmet : He wears a modified M1 Steel helmet with netting and helmet band. Left arm : Posed to carry the rifle. Upfolded sleeves and wrist watch are well defined. Right arm : Posed to throw a hand grenade. Rifle : He carries a shortened version of MAS.36 rifle. MAS36 CR39 was designed for the cavalry and was later used by airborne forces. It features an aluminum folding stock and a shorter forearm and barrel. The stock is hollow and folds over the receiver. Another very nice kit in high sculpting and casting quality to complete an Indochina War scene when used together with Huguette Agony-1 and Huguette Agony-2 figures. Highs: Nice subject,sculpt and cast. Interesting figure with sandbag body armor and unusual rifle. Verdict: A good addition to Indochina war scenes especially for a trench fight when used together with B6-35201 and 202.